As much as we love seeing our kids go in on the soccer or baseball fields, standing outside in the freezing cold makes us groan before we even get out of the car. Fortunately, the days of completely freezing our asses off on the sidelines may be behind us, thanks to the Chaheati Maxx Heated Chair, aka the answer to our weather-related prayers. 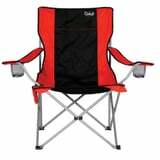 Moms and dads with kids in sports – or who like to take off camping for the weekend – can bring along this oversize chair, which comes with a rechargeable battery and a carrying case. Read through to get a look at this no-brainer invention, and try not to buy one for every single family member. Next article8 Grain-Free Chips, Because Paleo Eaters Deserve Great Snacks, Too!